Russia was second behind the United States with 21 launches with one failure. 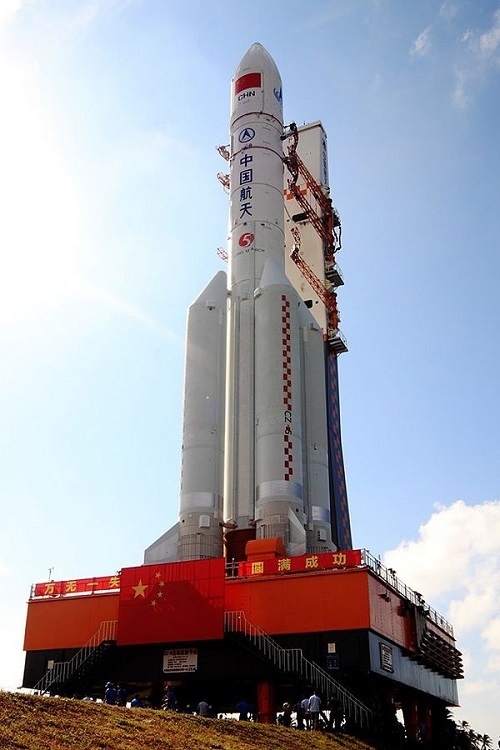 China conducted 18 launches with one failure and one partial failure, followed by Europe with nine successful flights. Japan and India followed with seven and five launches, respectively. Each nation suffered a launch failure. New Zealand conducted its first ever orbital launch in 2017. Falcon 9 first stage descends toward its landing pad. Falcon 9 boosters launched 48 communications satellites in 2017. That total included 40 Iridium-Next spacecraft that were launched on four separate flights from Vandenberg Air Force Base in California. 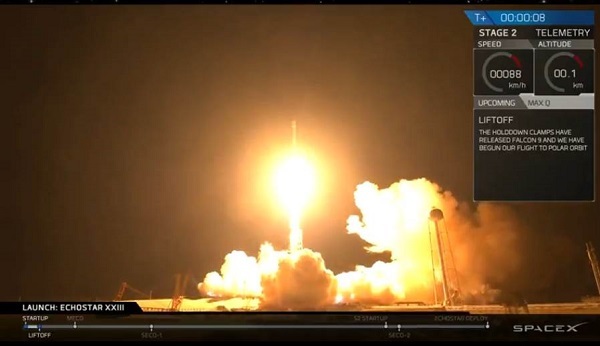 SpaceX launched four Dragon resupply missions to the International Space Station (ISS). The company also launched two defense payloads, including the mysterious X-37B space plane that had previously flown only on United Launch Alliance’s (ULA) Atlas V booster. SpaceX’s efforts to recover and reuse boosters and spacecraft came to fruition in 2017. Elon Musk’s company successfully recovered 14 of the 18 first stages, with no effort made on four other flights due to mission requirements. Eight of the first stages landed on off-shore drone ships, with six others touching down at Cape Canaveral. 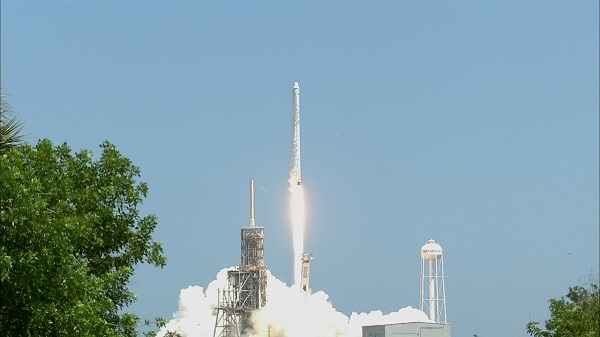 Five of the 18 Falcon 9 flights flew with reused first stages. 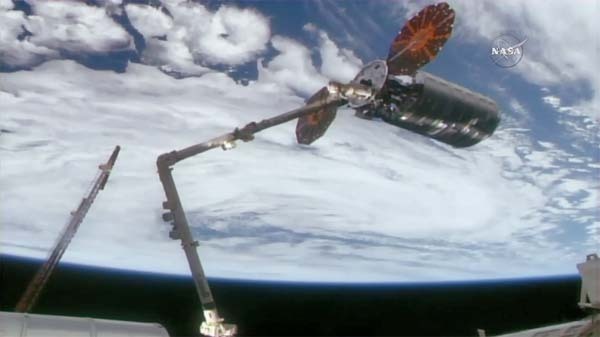 Two of the four Dragon resupply missions to the space station used refurbished capsules. One of the refurbished capsules was launched by a reused first stage. SpaceX also introduced the Falcon 9 Block 4 variant in 2017. The rocket has more powerful engines and titanium grid fins to improve recovery of the first stage. The company expects to introduce an upgraded Block 5 booster — Falcon 9’s last variant — later this year. ULA launched eight times in 2017. Six Atlas V boosters carried four U.S. defense payloads as well as a TDRS M communications satellite for NASA. An Atlas V also launched an Orbital ATK Cygnus resupply mission to the space station in April. ULA conducted the penultimate flight of the venerable Delta II rocket on Nov. 11. The booster lofted NOAA’s Joint Polar Satellite System (JPSS-1) meteorological satellite into orbit from Vandenberg Air Force Base. ULA also launched the Department of Defense’s Wideband Global SATCOM 9 (WGS-9) communications satellite aboard a Delta IV booster in March. The launch was conducted from Cape Canaveral Air Force Station in Florida. 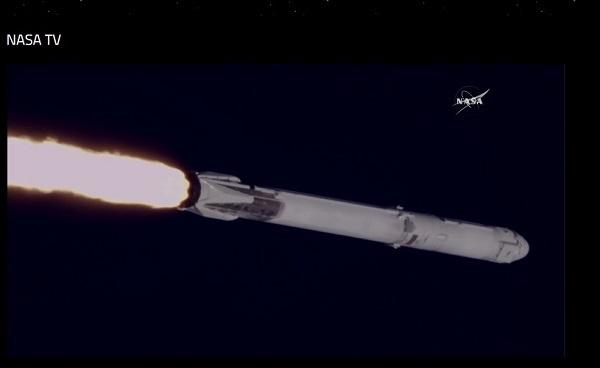 Orbital ATK launched three times last year. In August, a Minotaur IV booster lofted the ORS-5 mission for the U.S. Air Force’s Office of Operationally Responsive Space. The spacecraft, also known as SensorSat, is designed to scan for other satellites and debris in geosynchronous orbit. On Oct. 31, a Minotaur-C booster launched six SkySat remote sensing satellites for Planet from Vandenberg Air Force Base in California. Minotaur-C is an upgraded and renamed version of the Taurus booster. 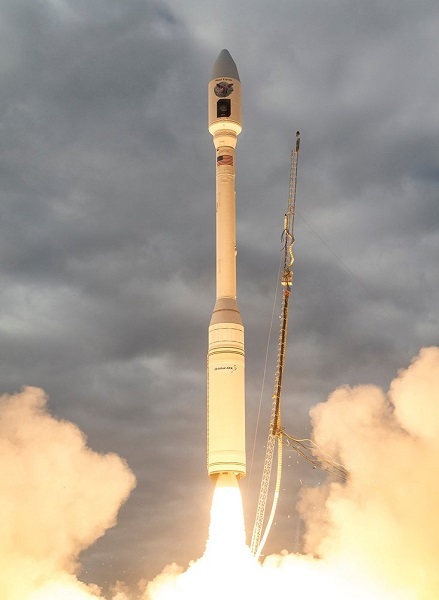 The following month, an Antares booster launched a Cygnus resupply ship to ISS from Wallops Island in Virginia. It was the second launch of an Orbital ATK Cygnus in 2017. 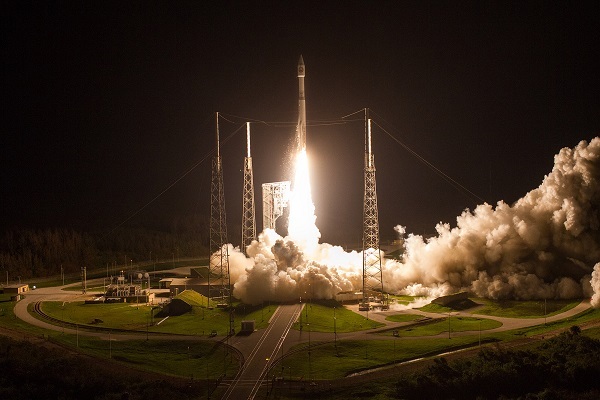 The previous cargo ship was launched aboard an ULA Atlas V from Cape Canaveral in April. Russia came in second, launching 21 times with one failure. This total was an increase over the 19 launches the nation conducted in 2016. Russia also suffered one launch failure that year. 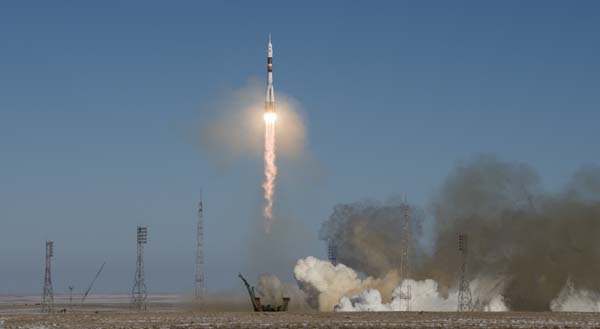 The Russian launches included four Soyuz crew missions and three Progress resupply flights to the International Space Station (ISS). The other 14 launches break down as follows: communications satellites, seven; military, three; Earth observation, two; GLONASS navigation and meteorological, one apiece. Russia began 2017 with its one of its key boosters, Proton, grounded due to quality control problems. The rocket did not make its first flight until June after a year-long stand down. The Proton flew only four times in 2017, a small number of launches for the workhorse launcher. Russia suffered a setback in late November when the Meteor M2-1 weather satellite and 18 secondary payloads failed to enter orbit after launch aboard a Soyuz rocket from the Vostochny Cosmodrome. Officials have blamed a malfunction in the Fregat upper stage. China launched 18 times with one failure and one partial failure last year. This was a reduction of four from the 22 launches the nation conducted in 2016. Chinese launches by primary payloads break down as follows: military, five; communications, five; Earth observation, four; Beidou navigation, meteorological and space station, one apiece. A highlight of the year came in April when a Long March 7 booster launched the Tianzhou-1 resupply ship to the unoccupied Tiangong-2 space station. The supply ship docked with and undocked from the station multiple times and also carried out a number of experiments. China debuted two new small-satellite boosters in 2017. The Kuaizhou 1A (KZ-1A) rocket made a successful maiden flight in January. The launcher, an upgraded version of the Kauizhou 1 rocket, is capable of lifting payloads weighing up to 300 kg (661 lbs) into low Earth orbit (LEO). The Kaituozhe-2 (KT-2) rocket successfully launched a payload for the first time in March. The booster is capable of launching a 350-kg (772-lb) payload to LEO or a 250-kg (551-lb) payload to a 700-km (435-mile) sun synchronous orbit (SSO). The Chinese space program suffered two setbacks in 2017. In June, a Long March 3B rocket placed the ChinaSat 9A communications satellite in the wrong orbit. The spacecraft was able to reach its intended orbit using on-board propulsion at the cost of a reduced operating life. The following month, a Long March 5 failed on its second flight, destroying the Shijian 18 experimental communications satellite. 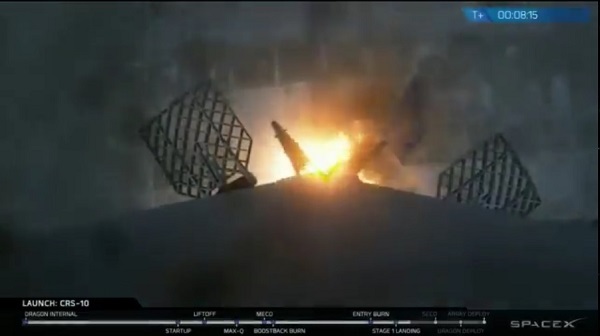 Officials have not provided an explanation for the accident, which reportedly originated in the booster’s first stage. The failure was a setback for China’s ambitious space station and lunar exploration programs, which are dependent upon the heavy-lift Long March 5. The Chang’e-5 mission, which is designed to return soil samples from the lunar surface, was delayed from 2018 to 2019. China plans to launch the core of a permanent, multi-module space station in 2019 using a Long March 5. Construction of the station is expected to take about three years. 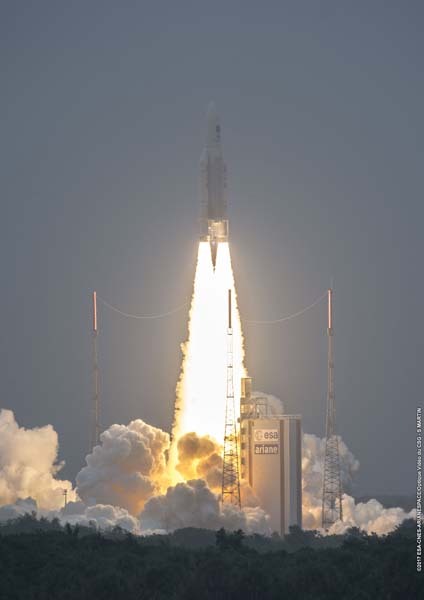 Europe launched nine times without failure, including six Ariane 5 and three Vega flights. There were actually 11 flights from the European launch center in French Guiana. Two Soyuz launches conducted at Kourou are included in the Russian launch total. Ariane 5 boosters launched 12 communications and four Galileo navigation satellites. The Vega rockets lofted two Earth observation spacecraft and a military reconnaissance satellite into orbit. The two Soyuz launches carried one communications satellite apiece. Japan launched seven times with one failure. Six H-2A missions carried three Michibiki navigation satellites, two military reconnaissance spacecraft, one Earth observation satellite, and one technological demonstration spacecraft into orbit. The lone failure occurred on the maiden flight of the SS-520 microsat launcher in January. The booster, an upgraded sounding rocket, was carrying a CubeSat. 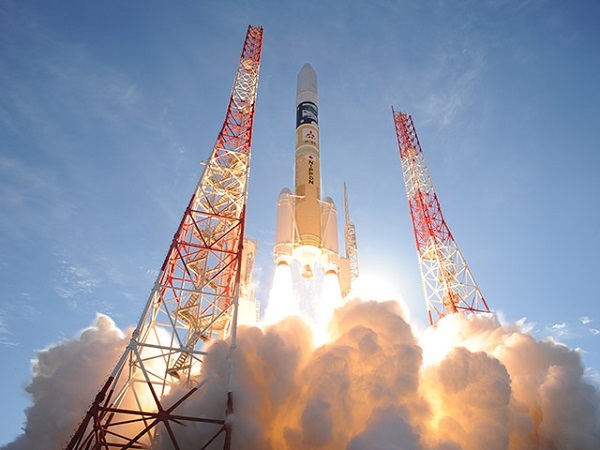 JAXA says that a second attempt is scheduled for later this month. India launched five times with one failure. ISRO’s boosters successfully launched two communications and two Earth observation satellites into orbit. India set a new world record by launching 104 satellites on a single PSLV booster in February. 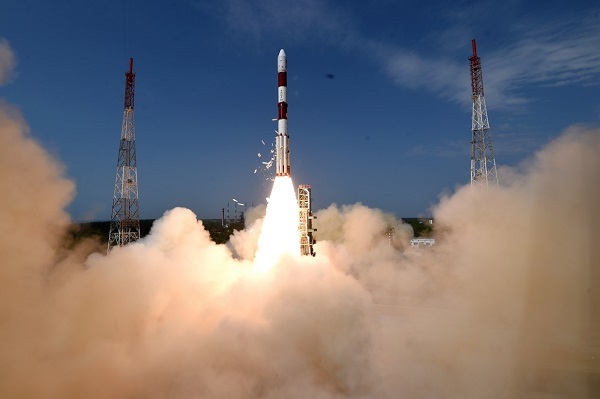 The CartoSat 2D remote sensing satellite was accompanied by 103 secondary payloads from India and foreign customers, including 96 spacecraft from the United States. ISRO suffering a rare failure of its reliable PSLV booster in August when the payload shroud failed to separate. The accident destroyed an Indian Regional Navigation Satellite System (IRNSS) spacecraft. The PSLV rocket was grounded for the rest of the year, but it scheduled to return to flight next week. The lone launch attempt from New Zealand of Rocket Lab’s new Electron booster failed in May. A second attempt carrying CubeSats from Planet and Spire is scheduled for January. Falcon 9 was the most used booster in the world with 18 launches. Soyuz came in second with 14 launches, including one failure. Ariane 5, Atlas V and H-2A were tied in third place with 6 launches apiece last year. China used nine different rockets and variants to launch 18 times. The United States used seven different boosters to accomplish 29 launches. Russia launched 21 times using five different rockets. India used three boosters, Japan two and New Zealand one. *Russian conducted launch from Baikonur Cosmodrome. Zenit booster composed of Ukrainian first stage and Russian upper stage. There were 13 support missions flown to ISS in 2017. The list includes four crew flights using Russia’s Soyuz spacecraft and booster and nine missions flown with by fleet of American and Russian resupply ships. SpaceX flew four Dragon missions to ISS last year, with the Russian Progress flying three times. Orbital ATK flew two Cygnus freighters to ISS, one launched aboard its own Antares booster and the other flown on an ULA Atlas V rocket. China was also busy with its own space station program in 2017. The Tianzhou-1 resupply ship docked and undocked repeatedly with the unoccupied Tiangong-2 space station and also carried out a series of scientific experiments in preparation for a permanent space station set to launch next year. Your typical suborbital flight is usually conducted with a sounding rocket that carries one or more scientific experiments. As such, they don’t generate a whole lot of attention or media coverage. Blue Origin’s suborbital flights are different. On Dec. 12, the company launched upgraded versions of its reusable New Shepard booster and capsule, marking a return to flight for the first time in 14 months. The new capsule includes large windows that will be used on later human-rated versions of the spacecraft. 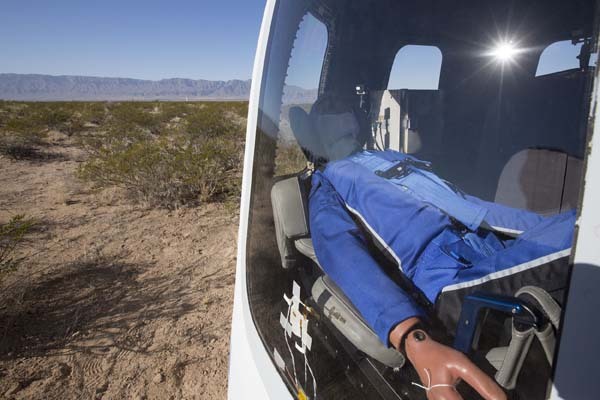 The December flight carried numerous scientific experiments as well as an instrumented test dummy named Mannequin Skywalker. 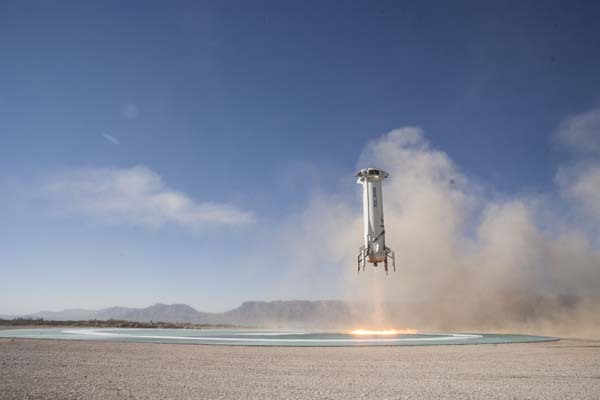 This was the first New Shepard flight to be conducted under a FAA-issued launch license, which enabled Blue Origin to collect revenues for payloads flown aboard the vehicle. The company says it is planning a series of automated flights in 2018. It could be ready to fly scientists with their payloads on a human-rated version of New Shepard capsule by the end of the year. The New Shepard flight was one of 21 suborbital rocket launches conducted worldwide in 2017. Eighteen of the flights were successful, with one failure and two partial failures. These figures do not include ballistic missile tests. *Figures do not include suborbital ballistic missile tests. Suborbital launches took place from eight locations worldwide, five of which were located in the United States or run by the U.S. government. (Kwajalein Atoll in the Marshall Islands is operated by the U.S. Army.) American facilities hosted 16 of 21 suborbital launches in 2017. The Baikonur Cosmodrome in Kazakhstan tied with NASA’s Kennedy Space Center by hosting 12 launches that were conducted by Russia under a long-term lease. Russia also conducted 5 launches from Plesetsk, two from the European launch complex in French Guiana, and one from the Vostochny Cosmodrome. There were 11 launches from French Guiana. The total includes six Ariane 5, three Vega and two Soyuz launches. Vandenberg hosted nine launches last year, followed by Cape Canaveral and China’s Jiuquan Satellite Launch Center with seven apiece. China used four spaceports to conduct its 18 orbital launches. Rocket Lab’s launch complex on New Zealand’s Mahia Peninsula hosted its first launch in 2017. The maiden flight of the Electron small-satellite booster reached space but failed to orbit its inert payload. Another Electron flight is scheduled for later this month. The year saw the return of launches from NASA’s Kennedy Space Center (KSC) in Florida for the first time since the end of space shuttle missions in 2011. SpaceX launched 12 times from the refurbished Pad 39A, which the company is operating under a long-term lease with the space agency. SpaceX pressed Pad 39A into service after a Falcon 9 exploded on Pad 40 at Cape Canaveral Air Force Station while being fueled for a pre-launch engine test on Sept. 1, 2016. It took SpaceX more than a year to get Pad 40 back in operation. The company conducted its first launch from the rebuilt launch pad on Dec. 15, 2017. The U.S. Air Force’s 45th Space Wing, which operates the Eastern Test Range, had a very busy year. The wing supported 12 missions flown from Kennedy Space Center and seven more from Cape Canaveral. Officials expect the range to be even busier in 2018. Nine launches were conducted from Vandenberg Air Force Base in California. There were five flights of SpaceX’s Falcon 9, two ULA Atlas V launches, and one flight each of ULA’s Delta II and Orbital ATK’s Minotaur-C.
Wallops Island in Virginia supported a single Antares launch that send a Cygnus resupply ship to the space station. Wallops Island was busy with four suborbital sounding rocket in 2017. Poker Flats in Alaska led all locations with five suborbital launches, White Sands had three, Kwajalein Atoll hosted two, and Corn Ranch in Texas was the site of Blue Origin’s lone New Shepard flight. Thank for the write up. Pretty interesting to see. Next couple of years should be interesting. One concern is America having 2-3 man launch vehicles with just 1 small stations. We really need to develop multiple destinations for these. After the past 6 years, we should have such problems. Bigelow Aerospace is ready. Just provide access and they will have one up. It looks like SpaceX has successfully brought a large amount of the commercial launches back to America (particularly taking advantage of Russian misfortune). While the number of individual satellites is quite high (thanks to Iridium and CubeSats galore), the number of launches is still quite small compared to the mid-60s through the 80s. I’m sure the satellite customers are quite happy with price competition, but we aren’t doing “more” in space than we were back then. Dang it’s hard for the revolution to get going! Are you sure? I was under the impression that they would not be ready until 2020? I will say that I knew 1 person that worked there, but he was let go during one of the cut back rounds ( 3 years iirc, but I do not trust my memory ). He would say that they were mostly ready at the time, but still had some work to do. I remember reading the Soviet Year in Space publications and classified space intelligence reports back in the 1980s. They were launching 60+ missions a year back then. Part of the reason was that their satellites didn’t last very long. Most, if not all, of their photographic reconnaissance satellites still used film. Their medium-resolution satellites typically only operated for about three weeks and their high-resolution system (with multiple film canisters) lasted 6 months or so. A lot of their other operational satellites lasted for less than 2 years. The same can be said for most other nations’ satellites as well. Most communications satellites were designed to last for 5-10 years, though many did last much longer. Today’s satellites last much longer so we don’t have to launch replacements as often. GEO communications satellite markets appear to be nearly saturated. If even one of the large LEO systems is built, that will require a lot of launches to establish the initial constellation with regular replacement/technology upgrade launches required for years to come. Until there’s a reliable and economical means to get people to and from his stations, Bigelow has no reason to rush finishing his modules. We are and we aren’t doing more, right now a lot of the “more stuff to do in space” is in experimental phase, and we are utilizing imaging, communications and navigation from space in more ways too, but a lot of that “More” is in the form of 4 dragon capsules, 2 Cygus and 3 Progress spacecraft and their manifests for 2017. Primarily Dragon and Cygus from what I understand, progress mainly carrying spare parts, repair kits and consumables, and less in the way of experiments. Not sure about that however. As Larry rightly notes, Soviet launch totals in the 70’s and 80’s were inflated by being compelled to use lots of short-lived reconnaissance satellites. In so many ways, the global (and American especially) launch and satellite markets are in much better shape than they were back then. Attaching 1 to ISS and finish configuring as habitat will take 1-2 years. Then ideally, BA gets NASA endorsement for free flying. Without NASA endorsement, few will want to stay there. Given the size and mass of the Bigelow modules, it may well not be possible to attach one to the ISS. The BEAM is minuscule compared to a BA330 module. It’s an important test but not comparable to fitting a full sized module to the ISS. Some of the challenges of connecting a BA330 to the ISS include the physical interfaces (docking ports), utility interfaces, avoiding interference with other modules, and avoiding upsetting the center of gravity of the ISS that could make attitude control more difficult.